(March 21, 2019) The OU baseball team has had a great start to the 2019 season, as they have tallied a 18-4 record heading into their first Big-12 Conference series this weekend. The college baseball world has taken notice, as the Sooners at #25, have moved into the Top-25 for the first time this season. NOTE: This weekend's schedule is subject to adjustment, as the potential for severe weather is the forecast on this first weekend of Spring. Friday: OU (19-4; 1-0) wins Game 1 by a score of 5-1. Saturday, March 23 vs. Kansas (Norman, Okla.) .. After a long weather delay in the 7th inning, Oklahoma (20-4; 2-0) held on for a 4-3 victory in game number two of the Big-12 series with Kansas. Junior RHP Nathan Wiles (5-0) goes 7 innings to get the win. Jason Ruffcorn pitches the 9th inning to get his 5th save of the season. The final game of the series is scheduled for 1:00 PM on Sunday. Last edited by SoonerTraveler; 03-23-2019 at 10:03 PM. OU and OSU also play a mid-week game in Stillwater that does NOT count as a conference game. NORMAN – Sophomore Levi Prater struck out six over 5.0 innings and junior Jason Ruffcorn earned his second save of the weekend to lead the 25th-ranked Oklahoma baseball team to a 10-5 win over Kansas Sunday afternoon at L. Dale Mitchell Park. The Sooners (21-4, 3-0 Big 12) completed the Big 12 conference series sweep of the Jayhawks (13-10, 0-3 Big 12). Prater (5-1) allowed one unearned run on two hits to improve to 5-1 on the season. The Sooners play at Oklahoma State Tuesday in a non-conference Bedlam matchup in Stillwater, Okla. First pitch is scheduled for 6:30 p.m. Observation 1 ... The OU baseball problem = OSU. Over the previous 5 seasons (2014-18) there have been 23 Bedlam baseball games. OU has only won 5 of those games, going 5-18 against their rival. Current Streak: OU has lost 7 in a row. Tuesday night will be an opportunity to end that streak, in Stillwater. It is really hard to win 21 out of 25 baseball games, no matter who you schedule. So far, OU's Starting Pitchers have been outstanding, and the Closer (Jason Ruffcorn) has also been very good, with 6 saves so far. On the other hand, the other Relief Pitchers have been shaky. For example, in the loss to Missouri State, OU led by a score of 8-0 after 6 innings. Then, a series of OU relief pitchers allowed 7 runs in the 7th inning, and OU ended up losing 11-8. The preseason (season-ending) injury to junior LHP Braidyn Fink really hurt the pitching staff, as he was a dependable Relief Pitcher as a sophomore. The 2019 stats (so far) for the primary OU pitchers are posted below. The list is sorted by Innings pitched. Oklahoma plays a non-conference Bedlam contest at Oklahoma State Tuesday night in Stillwater. First pitch is slated for 6:30 p.m. at Allie P. Reynolds Stadium. The game will be broadcast on the Sooner Sports Network and Sportstalk 1400 AM/99.3 FM and televised on FOX Sports Oklahoma. Oklahoma is ranked No. 22 in the D1Baseball Poll, No. 24 in the Collegiate Baseball Poll and No. 25 in the Baseball American and Perfect Game polls. OU is up three spots in the D1Baseball poll and one spot in the CBN poll, and appears in the other two polls for the first time this season. OU ranks second in the country with a 2.42 team ERA. The Sooners rank sixth in the country in triples (12), seventh in shutouts (4) and fifth in double plays (26). OU is in its second year under the direction of head coach Skip Johnson. Johnson is 59-29 as OU head coach, and led the Sooners to an NCAA regional appearance last season. Oklahoma won its 2,600th game in program history on Sunday. The Sooners are 2,600-1,501-12 (.634) all-time in their 119th season of competition. The Sooners have a 2.42 team ERA with 217 strikeouts to 85 walks in 223.0 innings. The starting pitchers have a 1.68 ERA and have struck out 136 batters and allowed 104 hits in 139.1 innings. Junior Jason Ruffcorn was named the Big 12 Newcomer of the Week. He appeared in all five games last week, earning three saves. He saved the games Saturday and Sunday, closing out the Sooners’ series sweep of Kansas, holding a 4-3 lead Saturday and getting five outs on Sunday. Oklahoma and Oklahoma State have played 305 times. The Cowboys lead the overall series, 163-142 and have won seven straight meetings. The series dates back to 1942. Last edited by SoonerTraveler; 03-25-2019 at 07:44 PM. (3/26/2019 / Stillwater) Sooners rallied for 3 runs in the top of the 8th to tie the score 5-5, but OSU pushed the winning run across in the bottom of the 9th to win 6-5. I want to get excited. I really do, but it seems like business as usual. We've lost at Dallas Baptist and we can't beat the Aggies. Just like a thousand times before. We'll be alright, but nothing special is my guess for now. I feel the same way. Trying to look on the bright side, Toby Roland pointed out the following on the radio this morning. So last year, OU lost the 4 Bedlam games by a combined score of 4-34!! It was like they would get behind OSU and not fight back. Yet, OU still finished 38-25 (14-10, Big-12). OU went to the 2018 NCAA regionals, and took eventual College World Series participant Mississippi State to the double-elimination game. Last night in Stillwater, the Sooners once again fell behind 5-0 in the 2nd inning, yet unlike last season, they fought back and tied the game 5-5 by the 8th inning. That is more runs scored in one game in Stillwater than OU scored in 4 Bedlam games last year. So, I am hopeful that the 2019 OU baseball team has more "fight" than they have had recently. We shall see. Conference teams like Texas Tech, Texas and TCU are very good, and those Cowboys are not going away. Let's see if OU can take 2 out of 3 this weekend in Morgantown. Looking ahead: Oklahoma heads east for a three-game series at West Virginia. OU will return home for a Tuesday game against visiting Oral Roberts at 6:30 p.m. Looking back: The Sooners’ seven-game winning streak was snapped by a 6-5 nonconference loss at Oklahoma State. OU opened Big 12 play by sweeping visiting Kansas in three games. Notable: OU’s team ERA is among the nation’s best at 2.56. … Lefthander Levi Prater is 5-1 with a team-low 0.98 ERA. He leads the team with 46 strikeouts. … Other players with six starts are Cade Cavalli (3-1, 1.64 ERA), Ben Abram (5-0, 2.73) and Nathan Wiles (5-0, 2.89). … The quartet has combined for 140 strikeouts against 36 walks. … Cavalli is also hitting a team-best .357 from his DH role. The games will be streamed live for free on WVUsports.com/Watch and the WVU Gameday App, while fans also can watch the stream live via Roku and Apple TV by searching for the "West Virginia Mountaineers" channel. The series begins on Friday, at 6:30 p.m. ET, while Saturday's first pitch is set for 4 p.m. The series concludes on Sunday at 1 p.m. With the threat of inclement weather in the Morgantown area this weekend, fans are encouraged to stay tuned to WVUsports.com and @WVUbaseball on Twitter for the latest updates on this weekend's schedule. Sooners are now 22-7 (4-2). Last edited by SoonerTraveler; 04-01-2019 at 01:48 PM. Cody Thomas, who made three starts and appeared in seven games as OU’s QB in 2014, is moving up to Double-A with the defending TL champion Tulsa Drillers, who will host the Arkansas Travelers in a season opener at 7:05 p.m. Thursday. 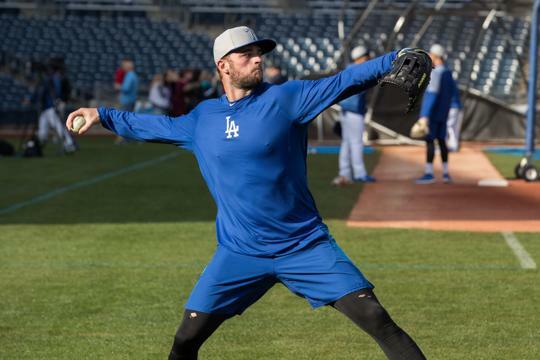 “I’m ready to get this season started,” Thomas said Monday evening before the Drillers’ first workout at ONEOK Field after leaving spring training in Arizona. It wasn’t Thomas’ first time at ONEOK Field. He had a two-run triple to lead OU past Oklahoma State 3-1 in his last visit in May 2016. Looking ahead: The Sooners open a three-game homestand against TCU. Game times are 6 p.m. Friday, 2 p.m. Saturday and 1 p.m. Sunday. Texas Southern visits Norman for games at 5:30 p.m. Tuesday and 3 p.m. Wednesday. Looking back: Oklahoma lost two of three games at West Virginia over the weekend, and followed that with an 11-inning loss to Oral Roberts on Tuesday. Notable: Kyler Murray is scheduled to throw the ceremonial first pitch before the game Saturday against TCU, at approximately 1:50 p.m. … The Sooners have left 49 men on base over the past four games and scored only nine runs during that span. … OU has lost three straight games, the longest skid this season. Friday, April 5 vs. TCU .. Sooners win 7-6 on a walk-off RBI single in the bottom of the 9th inning. This improves Oklahoma to 23-8 (5-2 Big-12). TCU is now 21-8 (5-2). Hopefully, the weather will cooperate, as thunder storms are predicted for Saturday. The Oklahoma baseball team has now lost 6 of their last 8 games. Following the midweek games, the Sooners (23-10, 5-4 Big 12) begin an 11 game road stretch with 3 games at Baylor next weekend. • Texas Southern (located in Houston) is in its 11th year under head coach Michael Robertson, who has led the Tigers to a 255-299 record and three NCAA postseason appearances. • The Tigers dropped two of three games at home last weekend to Grambling State, but have won five of their last eight contests. • Texas Southern has played four opponents on the OU schedule already this season (Kansas, Texas, Baylor, UAPB). TSU went 1-3 vs. Kansas, 0-1 at Texas, 0-2 at Baylor and 1-2 at UAPB. • Oklahoma and Texas Southern have played twice. The Sooners lead the series, 2-0. • This is the second straight year the schools will play a two-game midweek series. • OU won both contests last year, 12-0 and 10-1 in Norman. On the Air ... The games on Tuesday and Wednesday will air on FOX Sports Oklahoma Plus and will be simulcast on the radio with Toby Rowland and George Frazier on the call. The radio broadcast will air on Sportstalk 1400-AM / 99.3-FM and streamed on Sportstalk1400.com and the TuneIn mobile app. Last edited by SoonerTraveler; 04-09-2019 at 12:28 PM. Thirty NCAA® baseball student-athletes who excel both on and off the field were selected as candidates today for the 2019 Senior CLASS Award® in collegiate baseball. To be eligible for the award, a student-athlete must be classified as an NCAA Division I senior and have notable achievements in four areas of excellence: community, classroom, character and competition. See the link above for the complete list of 30 candidates. The 30 candidates will be narrowed to 10 finalists midway through the regular season, and those 10 names will be placed on the official ballot. Ballots will be distributed through a nationwide voting system to media, coaches and fans, who will select one candidate who best exemplifies excellence in the four C’s of community, classroom, character and competition. The Senior CLASS Award winner will be announced during the 2019 College World Series® in June. NORMAN – The Oklahoma baseball game against Texas Southern scheduled for 3 p.m. Wednesday at L. Dale Mitchell Park has been canceled due to unfavorable playing conditions. The weather forecast for Norman Wednesday afternoon includes a high wind advisory with winds near 30 mph and gusts up to 40 mph. The Sooners defeated the Tigers 10-2 Tuesday night. Oklahoma (24-10; 5-4) travels to Waco for a three-game Big 12 series at No. 24 Baylor (22-9; 6-2) this weekend. Game times are set for 6:30 p.m. Friday; 3 p.m. Saturday; and 3 p.m. Sunday. For the 4th Big-12 Conference series in a row, OU (25-12; 6-6) wins the Friday night game of the weekend series. Update: In the last 3 series (@ WVU; TCU; @ Baylor), OU won Friday night, then lost games #2 and #3 on Saturday and Sunday. Saturday; April 13, 2019: For the 3rd Big-12 series in a row, OU wins Friday night and then losses Saturday afternoon, this time a 7-3 loss at Baylor. Since sweeping Kansas to begin the Big-12 season, the Sooners (25-12; 6-6) have gone 4-8 in the past 12 games.